Does Texas need a 'Merry Christmas' law? Texas passed a law allowing "Merry Christmas" and "Happy holidays"
Editor's note: Danny Cevallos is a CNN legal analyst, criminal defense attorney and partner at Cevallos & Wong, practicing in Pennsylvania and the U.S. Virgin Islands. Follow him on Twitter: @CevallosLaw. The opinions expressed in this commentary are solely those of the author. (CNN) -- Here we go again. Christmas is upon us, and that means some people are getting sensitive about holiday greetings. In modern-day Texas, however, residents are now statutorily permitted to use the greeting of their choice without fear of legal reprisal: "Merry Christmas," "Happy Hanukkah" or "Happy holidays". 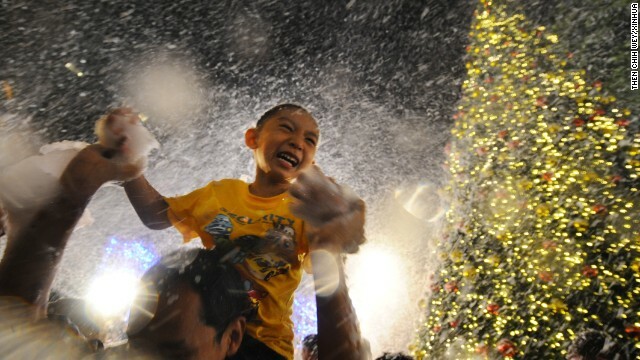 A child enjoys artificial snow at a shopping mall in Singapore on Tuesday, December 24. Ruben Torres, dressed in a Santa Claus outfit, waves to people from a boat with fishermen along the coast of Valparaiso, Chile, on December 24. 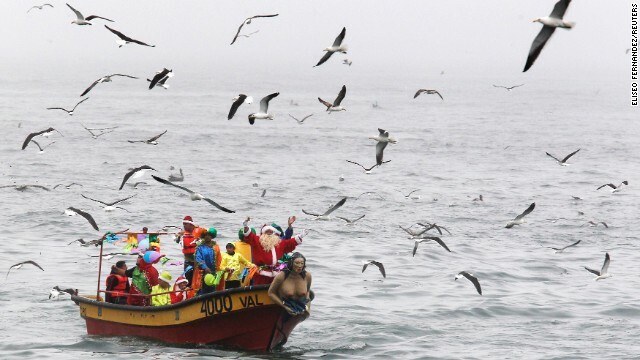 Every year, fishermen in Valparaiso organize a Santa Claus boat trip as people wait on the shore to receive their Christmas presents and well-wishes. An Indonesian Javanese Christian prays during Christmas Eve Mass in Yogyakarta, Indonesia, on December 24. People act out a nativity scene during the unveiling ceremony of the crib in St. Peter's Square at the Vatican on December 24. 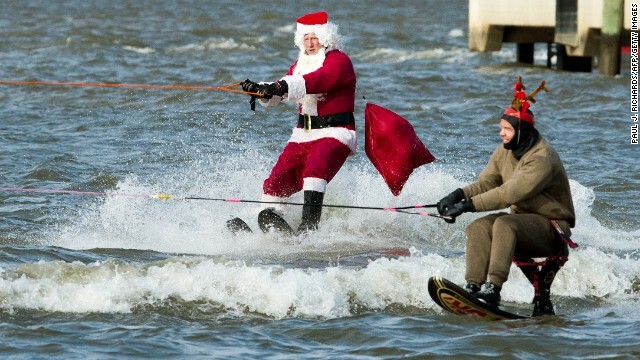 A water-skiing Santa Clause and a reindeer head down the Potomac River at National Harbor, Maryland, on December 24. 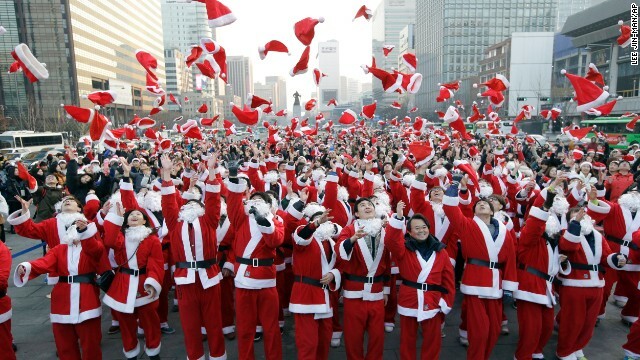 More than 1,000 volunteers clad in Santa Claus costumes throw their hats in the air as they gather to deliver gifts for the poor in downtown Seoul, South Korea, on December 24. 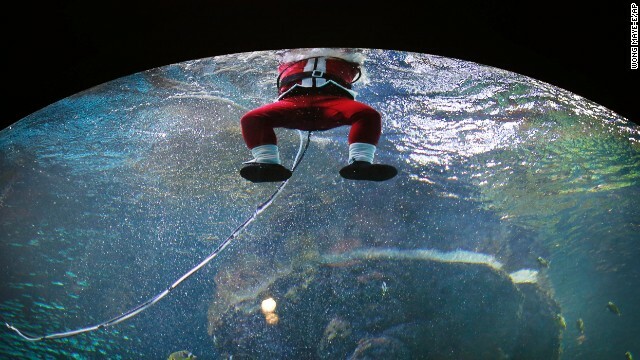 A diver dressed as Santa Claus surfaces after swimming in the Coral Garden tank at the South East Asia Aquarium of Resorts World Sentosa, a popular tourist attraction in Singapore, on December 24. A man dressed as Santa Claus from Lapland, Finland, listens to a girl's Christmas wish on stage at a Christmas event organized by the Finnish Embassy in Seoul, South Korea, on Monday, December 23. 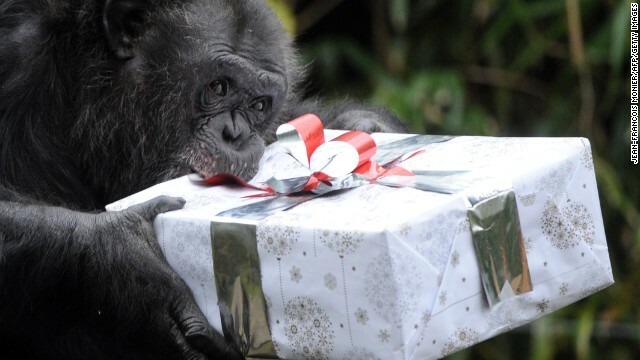 A chimpanzee opens a package filled with treats at a zoo in La Fleche, France, on December 23. 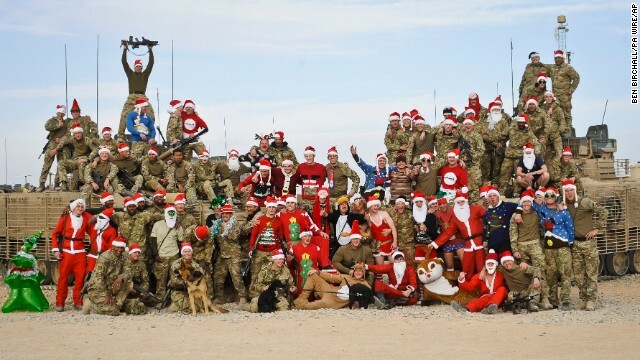 British troops at Patrol Base Lash Durai in Afghanistan get into the festive spirit December 23. 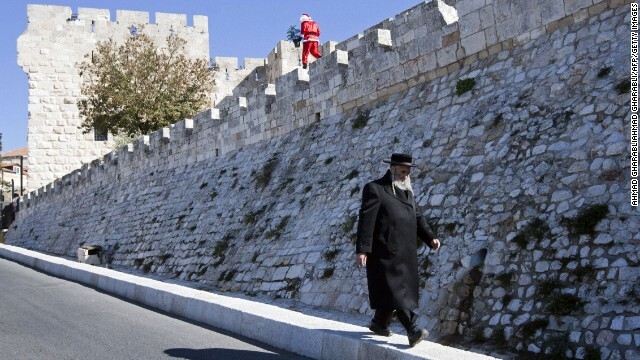 An ultra-Orthodox Jew walks beneath a Palestinian man dressed up as Santa Claus along the walls of Jerusalem's Old City on Sunday, December 22. 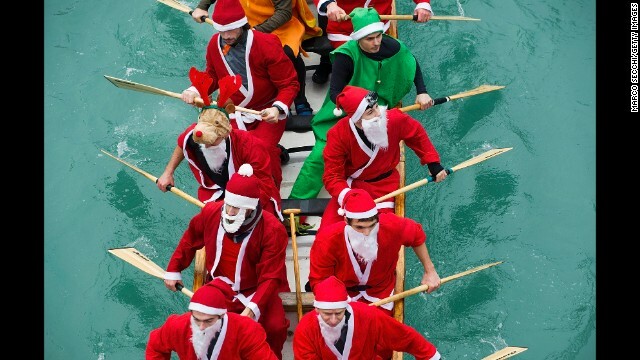 Rowers dressed in Santa Claus costumes take part in the Christmas Regatta on the Grand Canal on Saturday, December 21, in Venice, Italy. 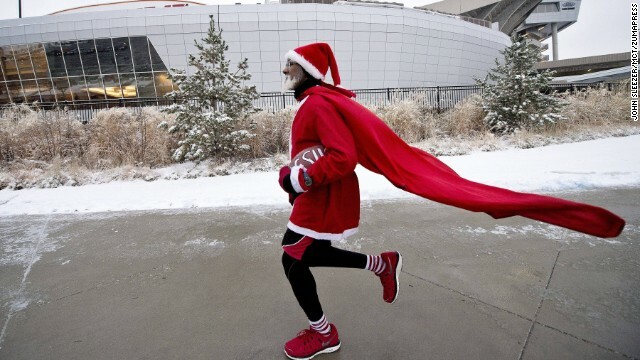 Michael Wheeler of Kansas City, makes one of his seven laps around Arrowhead Stadium on Sunday, December 22, before the game between the Kansas City Chiefs and Indianapolis Colts. The 63-year-old marathon runner performs this ritual before each Chiefs home game. 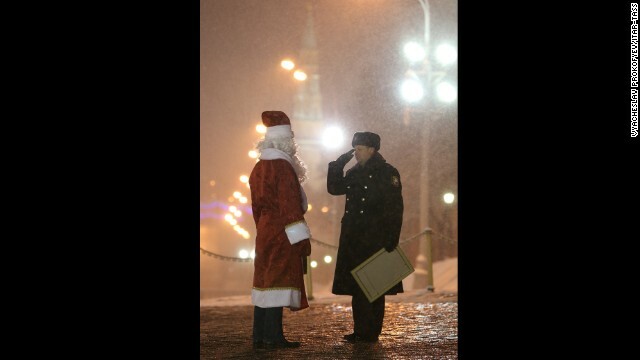 A timber truck driver dressed as Father Frost is seen at the Kremlin's Spasskiye [Saviour] Gate on Saturday, December 21. Petty Officer Second Class Sven Gruner is greeted by his girlfriend Rebecca Ankem at the Frigate Niedersachsen, docked after returning to Wilhelmshaven, Germany, on Friday, December 20, from a five-month anti-pirate operation off the Horn of Africa. Tom Tapp dressed as Santa Claus walks along the beach passing out candy canes and posing for pictures with beachgoers on December 20, in Fort Lauderdale, Florida. 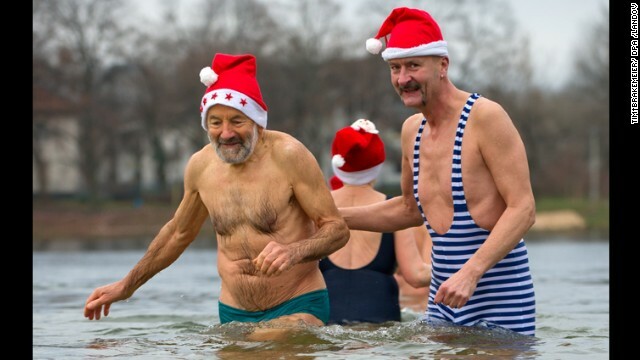 Tapp has been visiting the beach in Fort Lauderdale as Santa Claus for more than 25 years. Andy, Harvey and Dianne Thorn look at the arrivals board at Gatwick airport on December 20 in London. Large numbers of people are using the transport system to return home or head off on holiday. 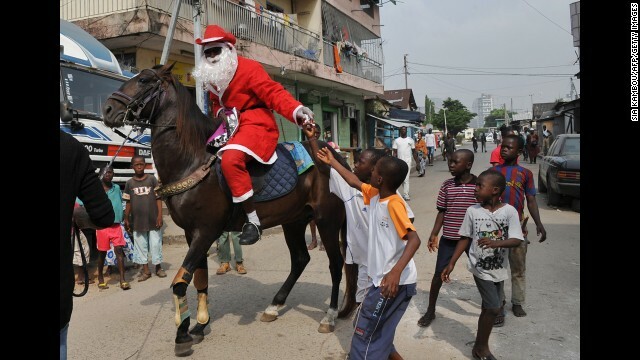 A man wearing a Santa Claus costume rides a horse and distributes gifts to children in a street of Abidjan, Ivory Coast, on December 20. Axel Richter prepares himself for the role of Santa Claus on Thursday, December 19, in Hanover, Germany. Richter starts growing his beard out in August to be sure it's long enough by Christmas when he visits nine families and brings presents to the children, reads them poems and celebrates Christmas with them. 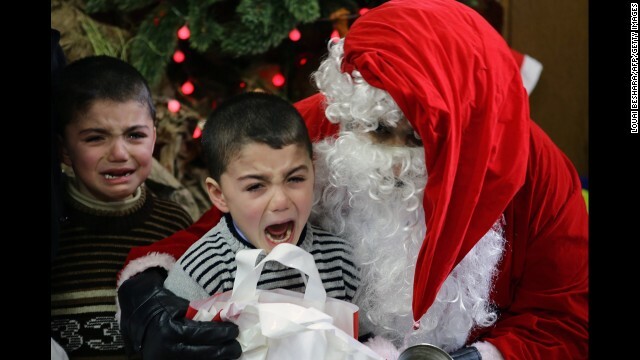 Boys cry as they are pictured with Santa Claus at a kindergarten in Damascus, Syria, on December 19. 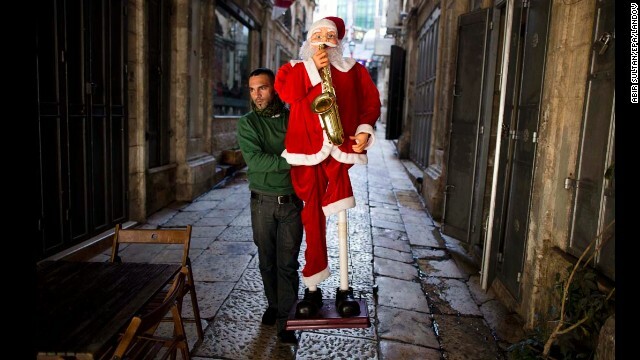 A Palestinian shop owner carries a Santa Claus figure on the street preparing for Christmas near Jaffa Gate in the Old City of Jerusalem, Israel, on December 19. 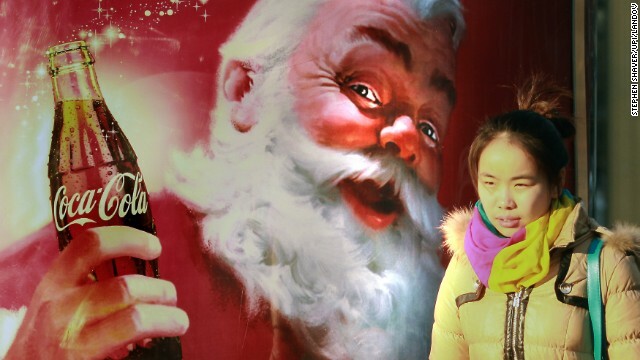 A girl walks by a Coca-Cola Christmas ad in Beijing on December 19. Workers wearing Santa Claus and reindeer costumes clean windows outside of a 100-foot-tall shopping mall at promotional event in Tokyo on December 19. 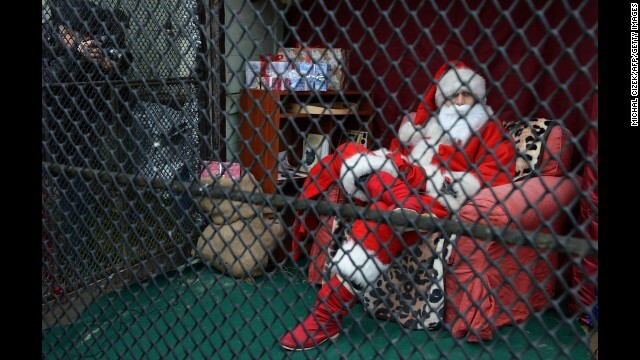 An activist dressed as Santa Claus sits in a zoo enclosure on December 19, in Prague. 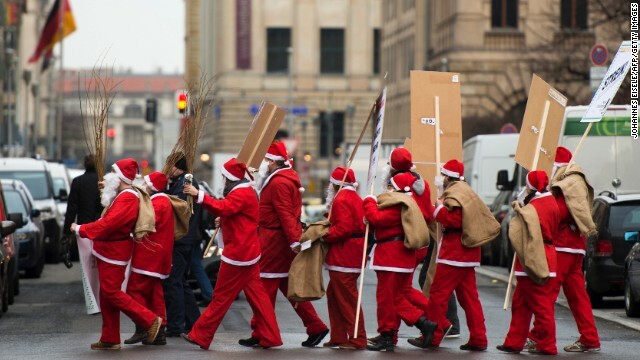 The activists protest against the influence of Santa Claus in Czech culture. 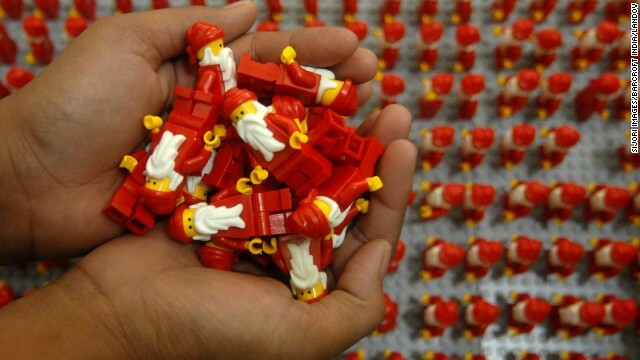 Women organize thousands of Lego Santa Clauses on Wednesday, December 18, in Surabaya, Indonesia. 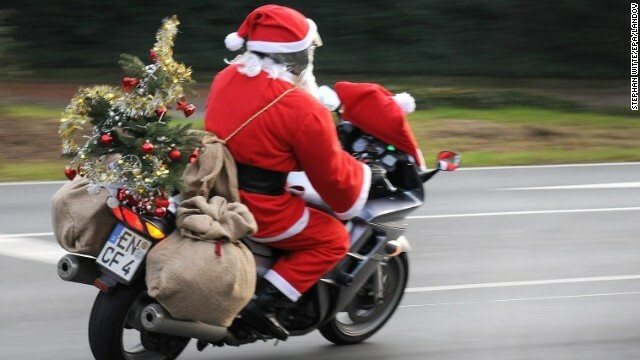 A man dressed as Santa Claus drives his motorcycle in Bochum, Germany, on December 18. 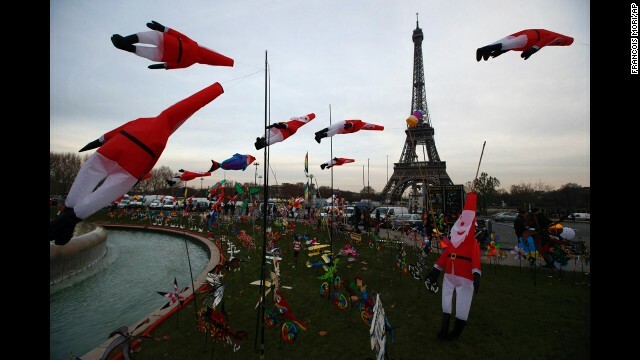 Kites in the shape of Santa Claus glide in the wind as part of an exhibition next to the Eiffel Tower in Paris on Tuesday, December 17. 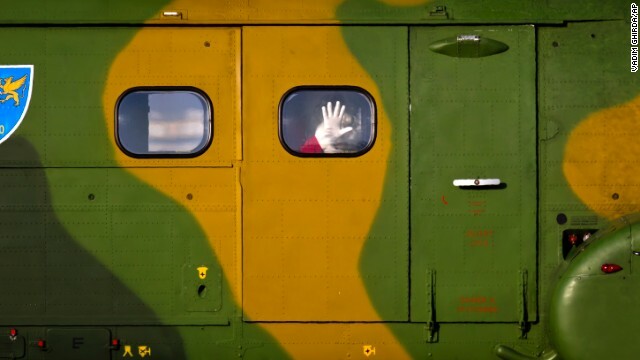 A man wearing a Santa Claus outfit waves from a military helicopter at a Romanian Air Force base in Otopeni, Romania, on December 17. 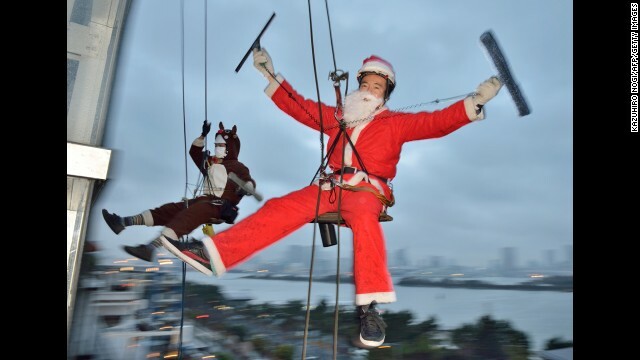 Santa arrived on a helicopter and distributed gifts to children. 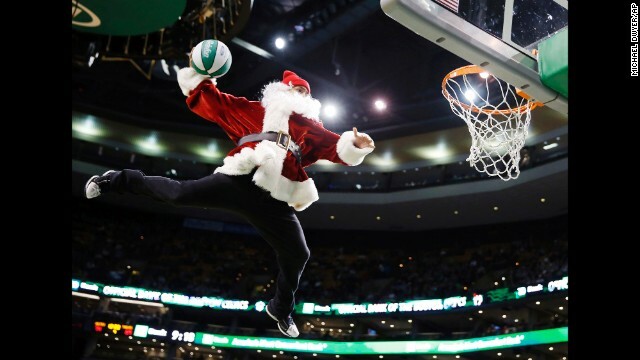 A performer in a Santa Claus costume dunks the ball during a timeout in the fourth quarter of an NBA basketball game between the Boston Celtics and the Minnesota Timberwolves in Boston on Monday, December 16. Miley Cyrus poses backstage at Jingle Ball 2013 in Washington on December 16. 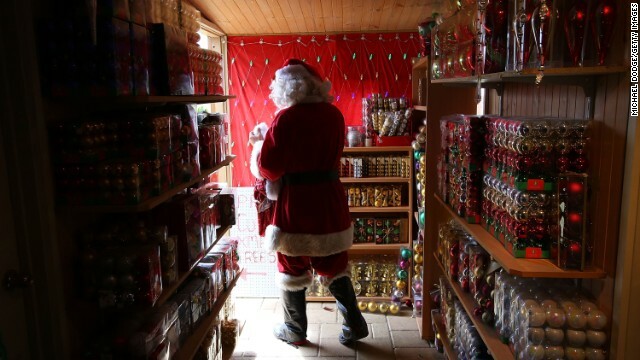 A staff member dressed as Santa Claus walks out to greet customers at the Santa's Place shop in Melbourne on December 16. 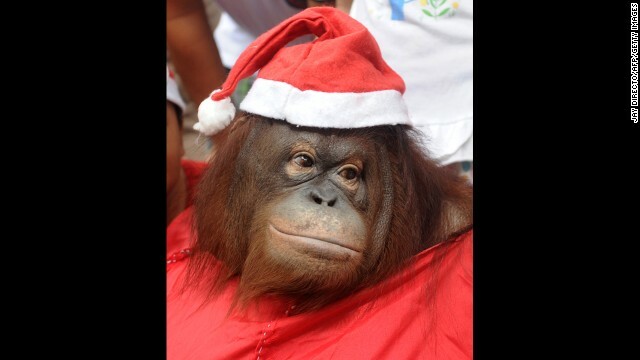 An orangutan named Pacquiao wears a Santa costume at the Malabon Zoo in Malabon City, Philippines, on December 15. 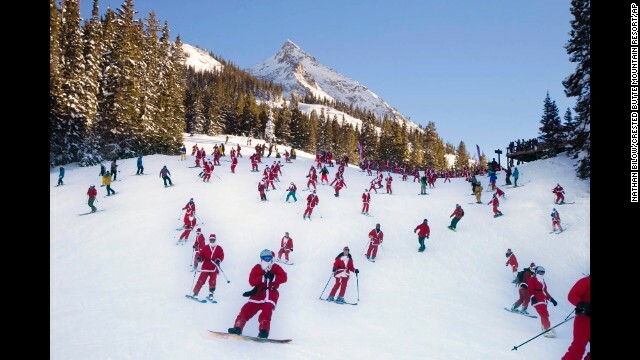 Santas ski from Uley's Ice Bar on Crested Butte Mountain in Crested Butte, Colorado, for the first 'Santa Ski Crawl' on Saturday, December 14. 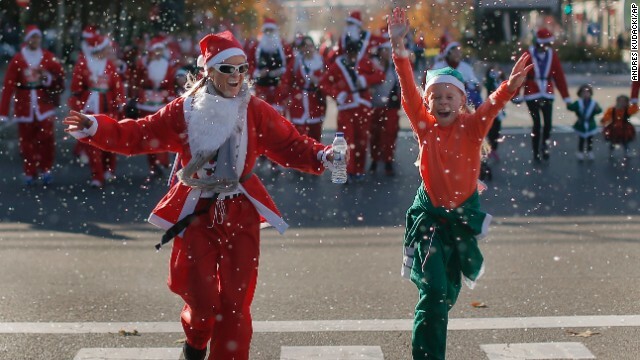 Revelers dressed as Santa Claus run under fake snow during a mini-marathon in Madrid on December 14. Men dressed as Santa Claus use the bathroom at a bar during a SantaCon event in Vancouver, British Colombia, on December 14. 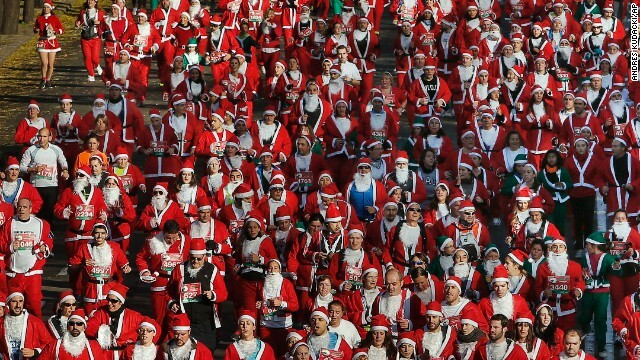 About 6,000 people dressed up as Santa Claus and his elves to run in the Madrid mini-marathon. 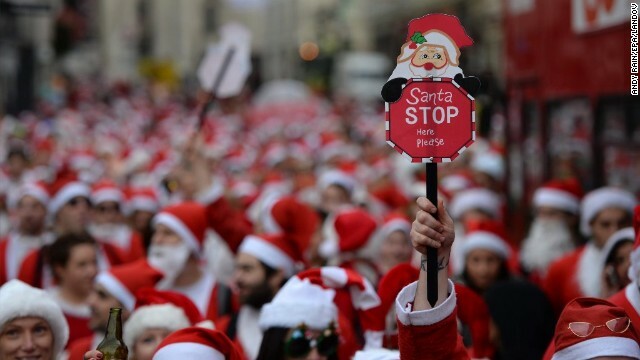 Hundreds of people dressed in Santa Claus costumes march through central London during the annual SantaCon celebration on December 14. 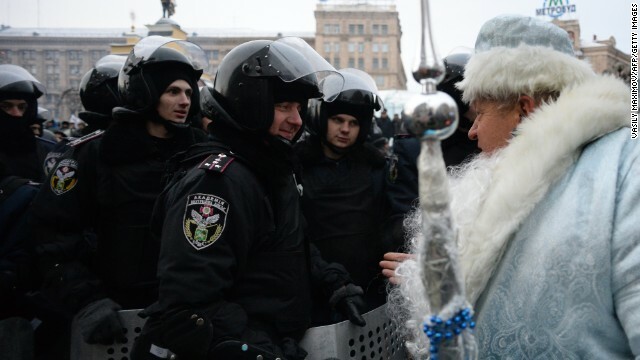 A man dressed as Santa Claus addresses riot police on Independence Square in Kiev, Ukraine, on Wednesday, December 11. 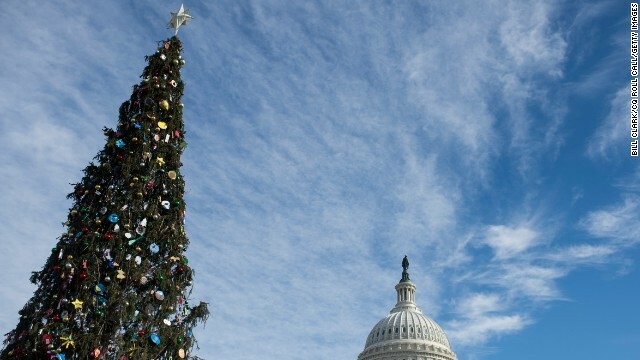 A Christmas tree stands on the West Lawn of the U.S. Capitol on December 11. 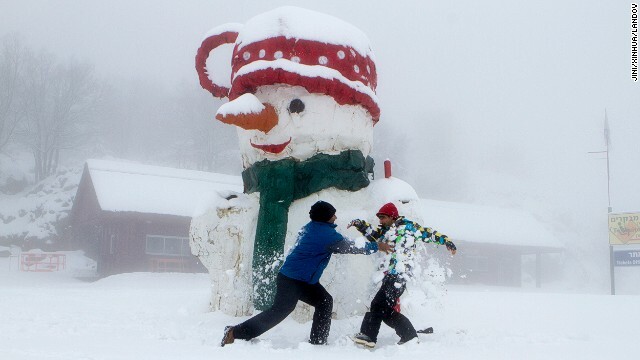 Israelis play next to a giant snowman on Mount Hermon in Golan Heights on December 11. 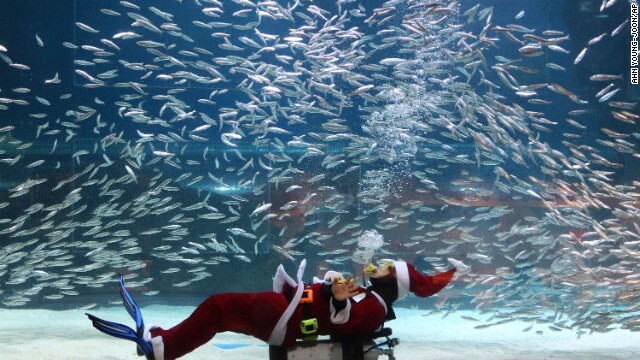 A diver dressed as Santa Claus swims with sardines at the Coex Aquarium in Seoul, South Korea, on Tuesday, December 10. Christmas ornaments and decorations are plentiful at Festive Productions Ltd. in Cwmbran, Wales, on December 10. 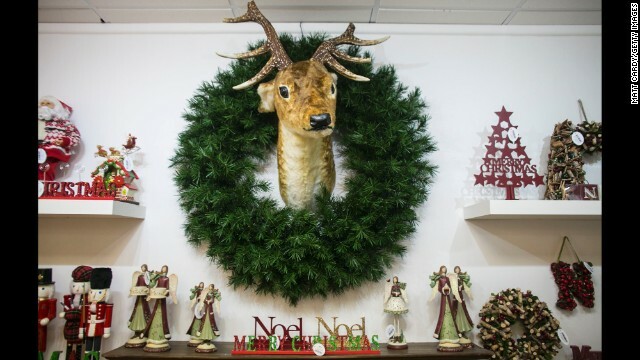 Stuart Baillieul, an employee with Festive Productions Ltd., selects decorations to be sold by retailers at retail shows. 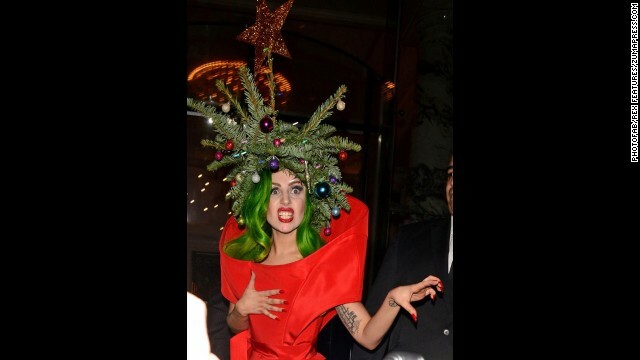 Pop singer Lady Gaga wears a real Christmas tree as a hat while returning to her hotel following the Jingle Bell Ball at London's O2 Arena on December 9. 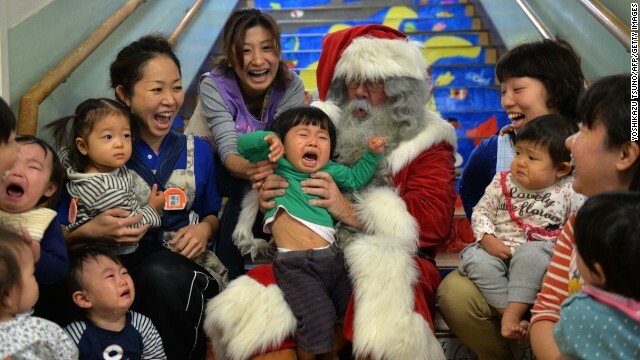 A man playing Santa Claus entertains children at a nursery school in Tokyo on December 9. A man checks out a statue called "Santa Claus Tourist in the USA" in Menton, France, on December 9. 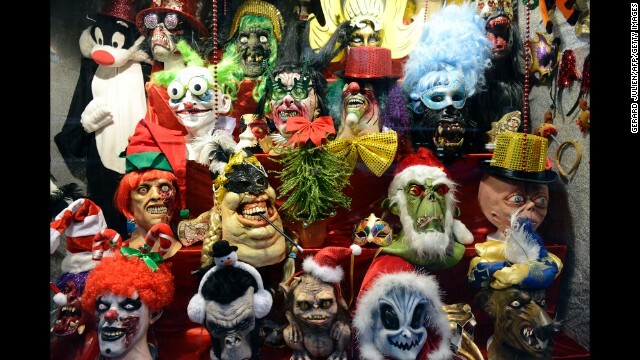 These horror masks, seen in a Madrid window display on December 9, lend a frightening air to the holiday season. 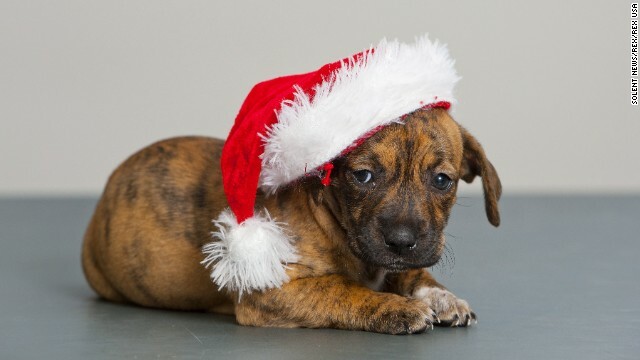 A puppy poses for a picture on December 9 at the Blue Cross center in Southampton, Britain. The adoption facility is looking for new owners for the 12 dogs of Christmas -- a dozen puppies from the same litter who are just six weeks old. Anthony Martinez, owner of a Miami Christmas tree lot, adjusts the outfit on a Santa Claus mannequin while waiting for customers December 9. 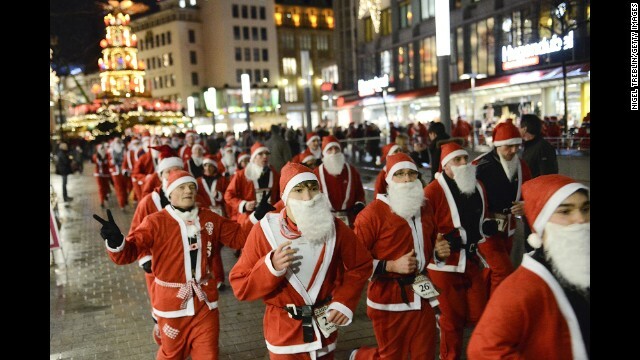 Runners dressed as Santa Claus take part in a Santa Run on December 6, in Hanover, Germany. 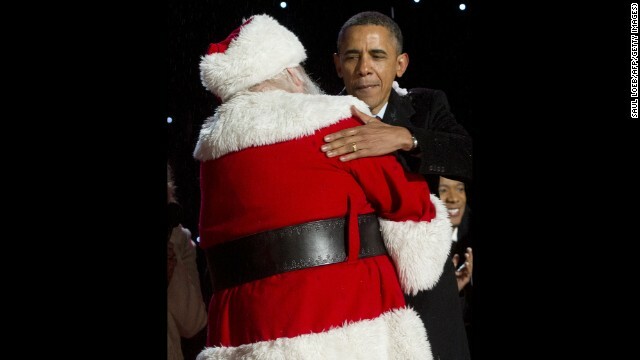 U.S. President Barack Obama hugs Santa Claus during the National Christmas Tree lighting ceremony on December 6. Inkota activists dressed as Santa Claus demonstrate in support of the "Make Chocolate Fair!" campaign on December 5 in Berlin. The campaign promotes fair-trade chocolate and better working conditions for cacao farmers in Africa. 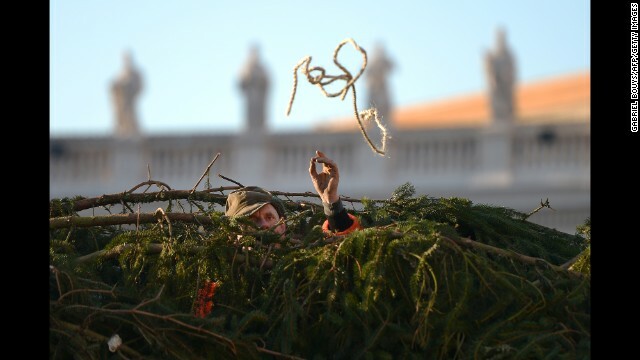 Workers at the Vatican set up the traditional Christmas tree in St. Peter's Square on December 5. 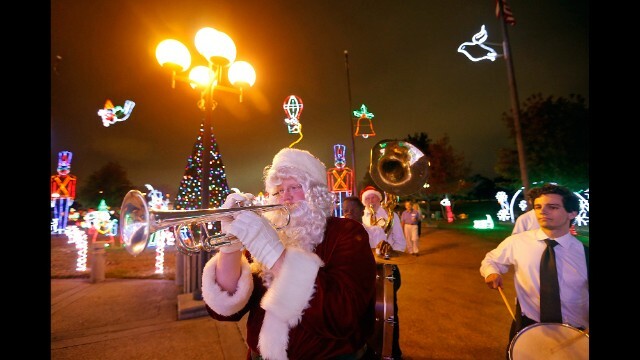 Doyle Cooper of the Red Hot Brass Band participates in the "Lights Up The Holidays" gala at Lafreniere Park in Metairie, Louisiana, on December 5. 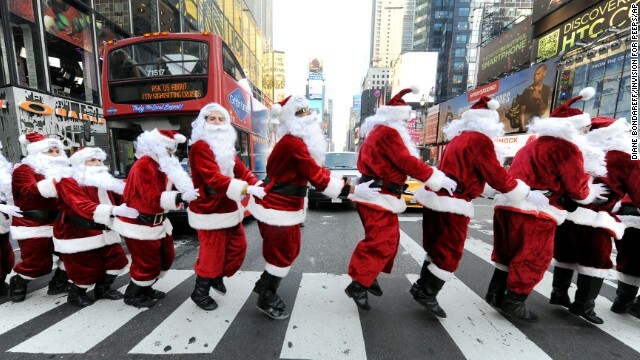 Santa Clauses bunny-hop through Times Square as they deliver holiday Peeps and spread cheer on December 4. 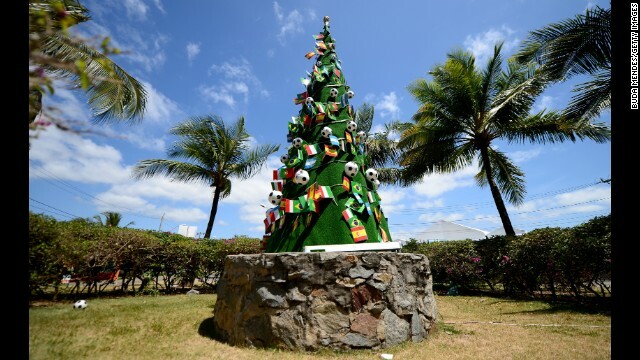 A Christmas tree decorated with footballs and national flags stands on the grounds of the Costa do Sauipe Resort in Costa do Sauipe, Brazil, on December 4. The resort was the venue for the final draw of the 2014 FIFA World Cup. 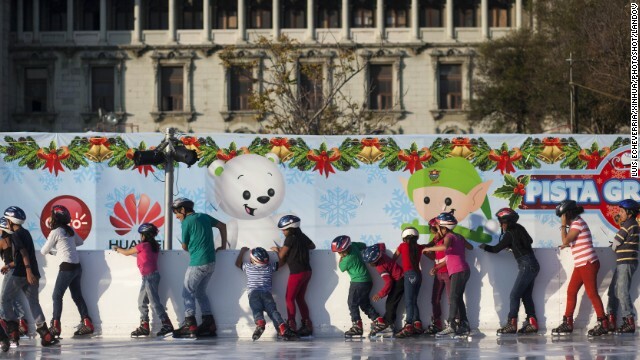 Young skaters in Guatemala City, Guatemala, hold on to a wall as they skate on an ice ring installed at Constitution Square on December 4. 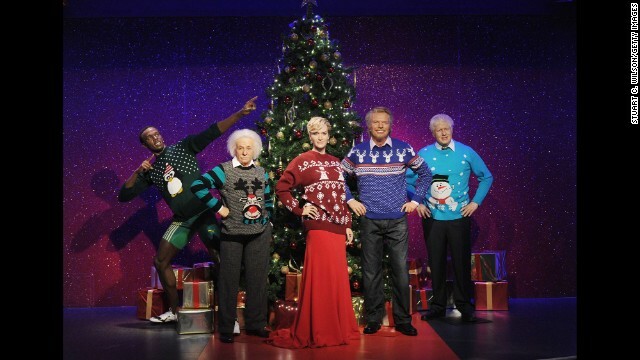 Wax figures of Usain Bolt, Albert Einstein, Kate Winslet, Richard Branson and Boris Johnson are dressed in Christmas sweaters December 3 in support of the Save The Children campaign at Madame Tussauds in London. 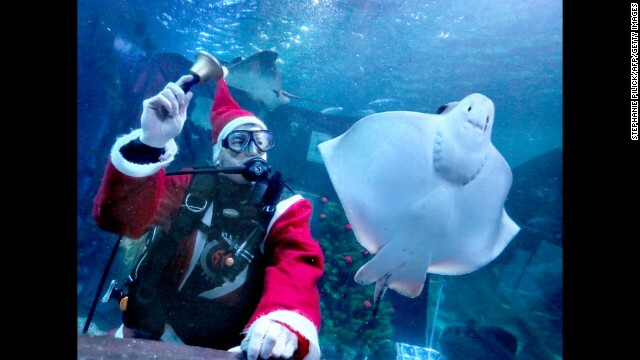 A diving Santa rings a bell next to a ray at the Sea Life Aquarium in Berlin on December 3. 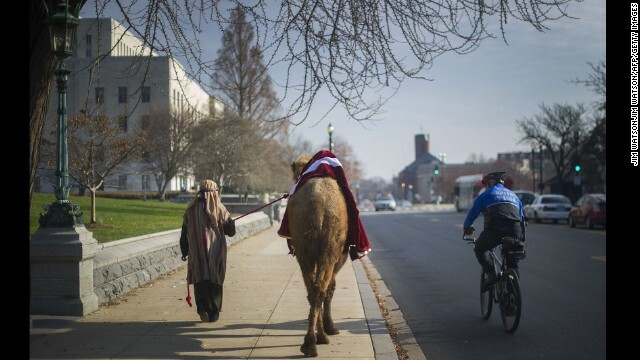 Kara Iden is watched by a police officer December 3 as she leads a camel to the Supreme Court to participate in a live nativity scene in Washington. 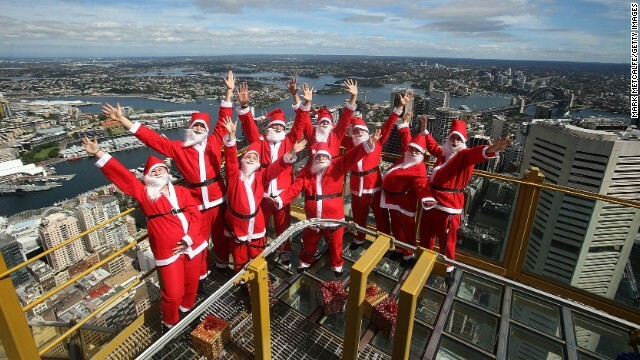 Santas visit the Skywalk at Sydney Tower on December 2 in Sydney. 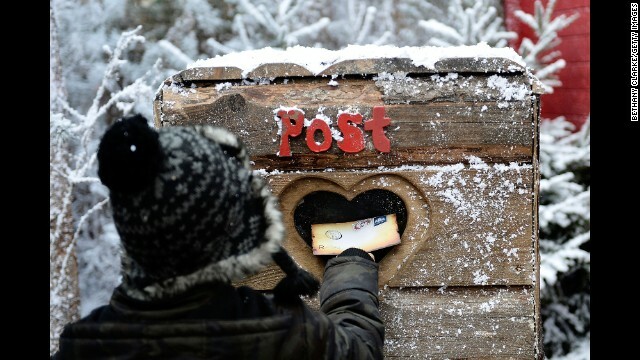 A child posts a letter to Santa in the Elf Village in Ascot, England, on November 30. LaplandUK opened its doors at its new location in Ascot, offering a Christmas experience set in a snow-covered forest with real huskies, reindeer and Father Christmas himself. 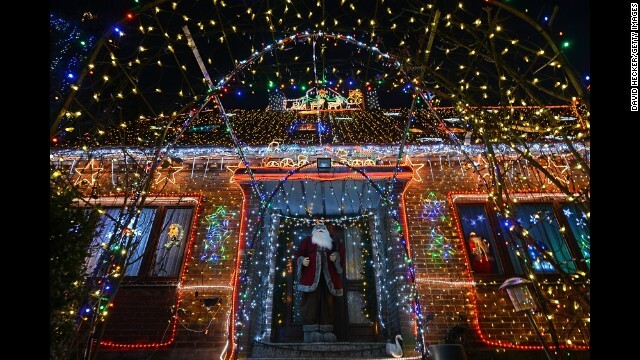 A figure of Santa Claus stands in front of the House of Family Vogt, lit by more than 450,000 lights, on November 30 in Buecken, Germany. A woman dressed as an angel adjusts her gaiters next to men dressed as Santa Claus during the general meeting of Berlin's Santas and Angels on November 30. 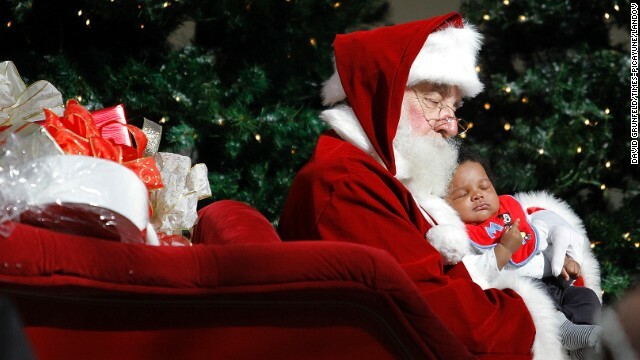 Santa and 2-month-old Ty'e Fishe have their picture taken November 29 at Lakeside Mall in Metairie, Louisiana. 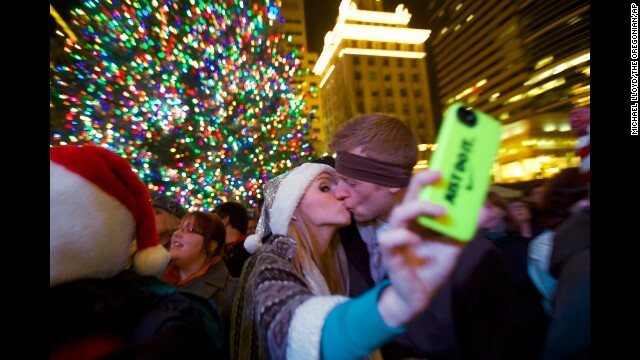 Savannah Rice snaps a picture with her boyfriend November 29 at Pioneer Courthouse Square in Portland, Oregon. State Rep. Dwayne Bohac helped last year to pass what is now known as the Merry Christmas law. He and the Texas Legislature wanted to ensure students could exchange traditional holiday greetings and display Christmas trees, menorahs and Nativity scenes at school, as long as more than one religion and a secular symbol are included. Constitutionally, this protective legislation is not really required, and teachers can wish holiday greetings without fear of liability. On the other hand, this law may allay any fears state employees have about exercising their rights to merrymake on government property. 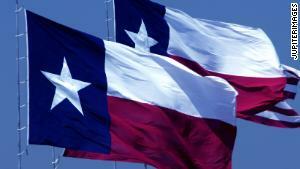 Texas passed a holiday observance law a year ago. It feels like this sort of thing didn't happen 30 years ago. When I was a kid, holiday greetings were the least of our worries. As kids, my brothers and I had other worries about what we'd hear during the Christmas season. We worried about hearing the voice of that Duffy kid down the street: His holiday greetings consisted of bad words and 70 mph snowballs. We worried about hearing there were no presents this year because, according to Mom, "Santa" already spent all "Santa's" money on cartons of Virginia Slims. Comparatively then, we were not too worried about whether we heard "Merry Christmas" or "Happy holidays" at school. Maybe we've run out of problems. Maybe it's because things are so much better now that we focus on that which never bothered us before. Or maybe it's because of a growing chasm of distrust between parents and school lesson plans. After all, this Texas statute was conceived by a legislator who was dismayed to hear his kids report on a "holiday tree" at school instead of a "Christmas tree." Of course, the First Amendment probably already protects our nonsecular greetings anyway. The Texas ACLU's official position is direct, if not hyper-technical: "I think it's stupid," said Terri Burke, executive director of the American Civil Liberties Union in Texas. According to Burke, there is no "war on Christmas" and no real need for this law. She may be right -- legally, that is. The Supreme Court cases in this area have focused less on greetings and more on the public display of symbols of the holiday season and whether they are in violation of the Establishment Clause (Amendment 1) of the United States Constitution. The Supreme Court recently observed that if a practice "touches upon" religion, it is impermissible under the Establishment Clause if it advances or inhibits religion in its principal or primary effect. The court has held for some time that the Establishment Clause, at minimum, prohibits government from appearing to take a position on questions of religious belief, or from making adherence to a religion relevant in any way to a person's standing in the political community. With that, some might argue that "Merry Christmas" is "taking a position"—specifically, an impermissibly Christian position on holiday greetings. But the Supreme Court reminds us what we've known for a while: Christmas celebrations can have a religious purpose, but they can also have a secular purpose. As long as the state has not impermissibly advanced religion or created an excessive entanglement between religion and government, there is no strict requirement for complete separation between Christmas and state. The Supreme Court notes that Christmas is a holiday recognized by Congress and national tradition. When the state depicts origins of that holiday, it can do so, and have a legitimate secular purpose. Legally, Christmas litigation always raises fascinating and important First Amendment issues. However, even this fan of constitutional law must concede that practically, perhaps we shouldn't be making federal cases out of whether kindergarten teachers can wear a Santa hat to class or hand out candy canes. Ultimately kids don't even care about "holiday trees," secular greetings and excessive entanglement. It's the adults: parents, teachers and legislators. 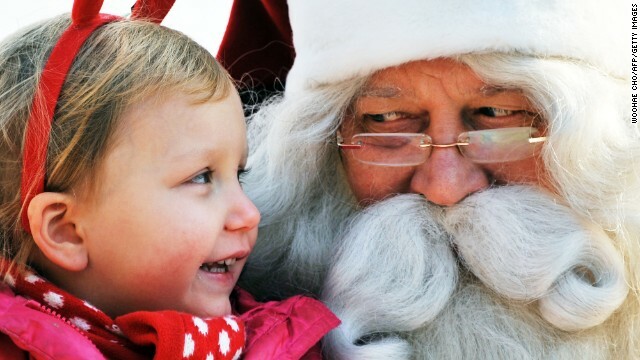 Kids care about one thing: presents. Especially my 6-year-old nephews. They don't care if the wrapping paper reads "Happy Flag Day" or "Budweiser" (way to go, Mom). As long as there's a robot inside. And that's what Christmas is really about. Ah well. Happy holidays, all the same.